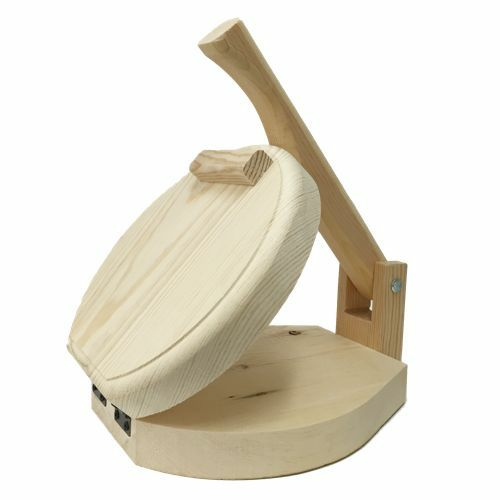 Round Wood Tortilla Press Tortilladora de Madera Redonda / Burrito Size Tortillas 10"
Round Wood Tortilla Press Tortilladora de Madera Redonda / Burrito Size - 11" x 13"11" x 13"
This wooden Tortilla Press is good to make up to 10 inch flour tortillas or large corn tortillas. It is the best. I have been looking for one for very long time. I just love it. I have use this press several times now and it out performs the light weight metal one I have. I purchased this wood heavy weight after breaking an metal one pressing tortillas. It looks like something build in a garage but, it's performance so far... exactly what I was looking for. I could see it wearing out over time but certainly not for a very long, long time. ConsIt looks like something build in a garage... Looks to be build out of pine, would look better it was built out of a hardwood like maple, oak or walnut. 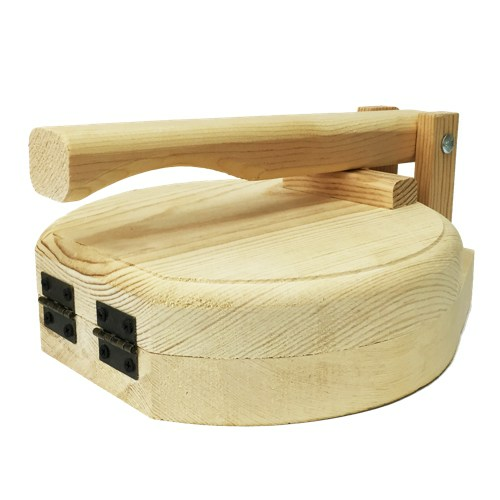 Tortilla Press Heavy Duty Iron Restaurant Size 10 "